Growing up in East London, but now residing along the scenic canals of Amsterdam, Szjerdene has been quietly honing her luscious take on music for the past few years and turning heads around the globe. With an impressive range of strings to her bow, Szjerdene’s unique mix of soul and folk inflected vocals combined with electronic left field sounds is about as seductive as it gets. Big things are coming for the artist with a body of new material in the pipeline, making it the perfect time to get an insight into the city she lives, Amsterdam. You can listen to Szjerdene's new single "Are You Here" below. Where’s the first place you visit when you return home from abroad? I really love staying indoors for a little while once I come back from travelling. Just having everything in its familiar place is really settling. My neighbourhood is really cool and full of creative people and things to enjoy. Now that the weather is warmer I love sitting on my balcony and chilling with my feet up. If you’re looking for romance, culture and plain good food you should definitely head to ‘Bazar’. Dimly lit, bustling and perfect for that first meet. It's a great environment to share stories and get to know someone for sure. I live really close to a place called Gaasperplas. It's a huge lake in the south east of Amsterdam. It’s so peaceful and beautiful. I’m really grateful that I can get there whenever I need to - I just set off on my bike and park up at a specific point. Although lots of people know about it, it feels secluded and it's rarely busy. It’s the perfect place to reflect or just sit and watch nature. You can find Boerderij Meerzicht in the middle of a forest. For the finest pancakes with pretty much any topping you want. My friend took me this year and it shot to my top 5 immediately! I really love the ‘Bitterzoet’. It was the first place I performed in and is now my best spot to party. It’s quite small, cosy and packed! My favourite night there is called “Rock The Boat” and it’s a guaranteed good time. Where's your favourite place to drink? 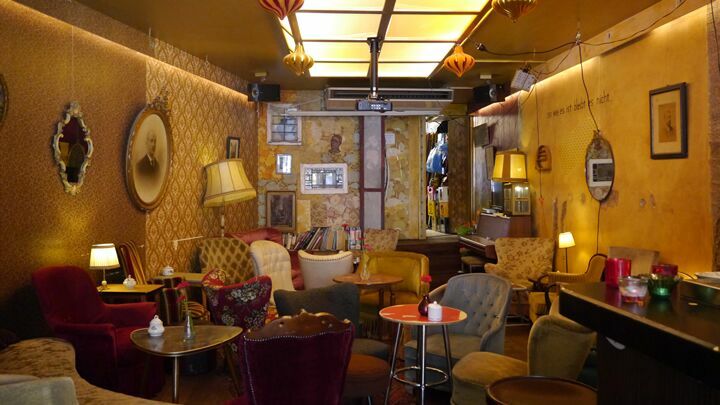 I was taken to this cool bar called Cafe Brecht recently. It has a real Berlin vibe with lots of sofas and random furniture all squashed in and oddly arranged. There’s something really chilled and intimate about it and it seems to attract people of a similar nature to it. It's a great place if you’re looking for that home from home feeling. What’s your earliest memory of your city? I used to visit Amsterdam every "Queens Day” from when I began travelling there until I moved. The weather was always perfect and people were out in their masses donned in the most unforgettable orange items ever. It was so interesting to witness the whole city celebrating and carrying on tradition. What one song sums up your city for you and why? This track was HUGE in Amsterdam, I heard it in every shop, festival and event you could imagine around its release. I really feel that Amsterdam is a ‘Peoples’ city and my understanding of the track is that it's about the voice of the people. Every time I hear it now I think of good times, long summer nights and BBQ’s with friends in the city. I’m really getting into handcrafted jewellery so anywhere that creates their own or sells unique pieces. There are lots of small boutiques and flea markets dotted around Waterlooplein so I’m really spoilt for choice! Do you have a fact about your city not a lot of people know?